For grandpa. Not interested in Windows? Chrome OS is the alternative offered on this laptop. No complicated hardware settings; just open it up and start surfing. Does Toshiba do a good job with this non-Windows concept? 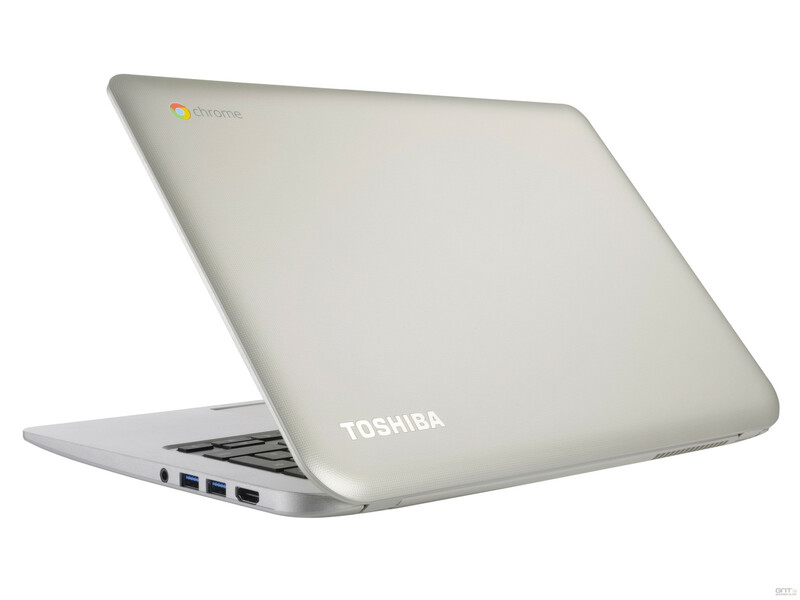 Toshiba Chromebook CB30-102: When Windows is too complicated. The ideal notebook for grandpa to surf the Internet? 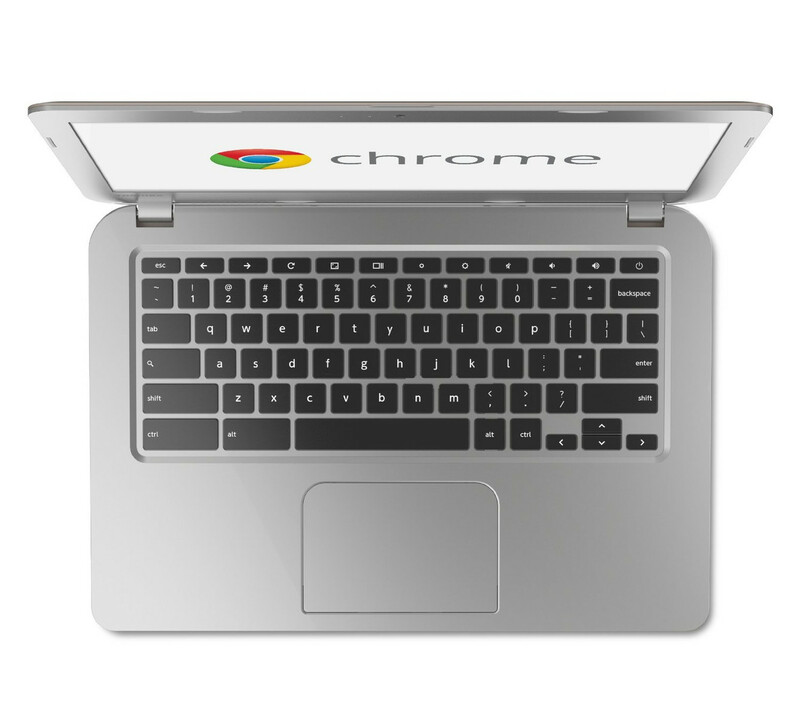 Chromebooks are computers with Google's operating system, Chrome OS (GNU/Linux). There are no official versions, as there are with Windows or Android (ex. Windows Vista, 7, 8.1, Android 4.3, etc.). Like the web browser on the Windows computer, the browser-based OS updates continually -- Build 4028 is the latest build. The computer does not bother its users with such trivialities. Who wants to know what hardware and which OS version are running under the hood? What matters is that it works. Turn it on, create a Google account or log into an existing one and we're off. There is not even a physical button for shutting down the system -- the Chrome user can simply close the notebook and open it again later. Samsung started it all with their Chromebook Series 5 in 2011. 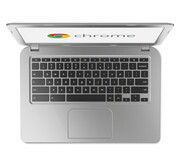 Since then, HP, Acer and Google have released their own Chromebook versions. 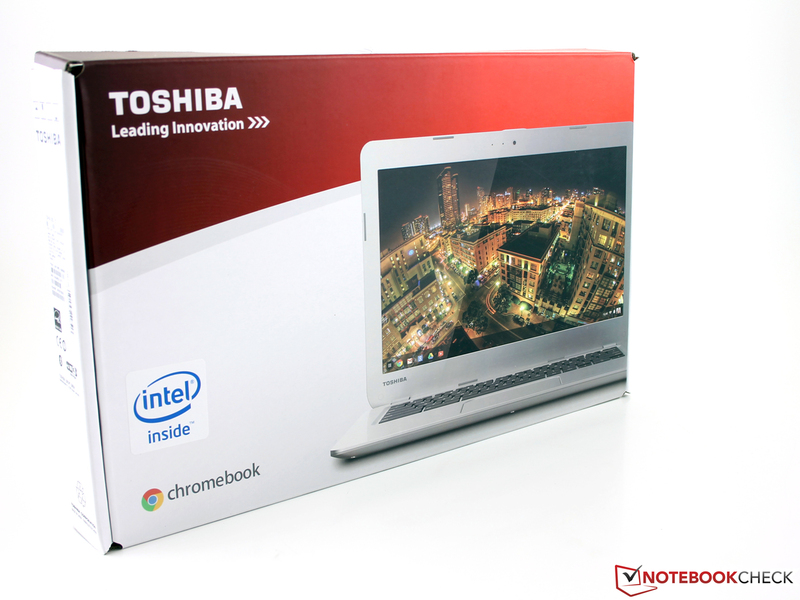 We will compare the Toshiba Chromebook CB30-102 with these other devices in this short review (tables, graphics). Besides the high-end Chromebook Pixel, the Chromebooks all have one thing in common -- a low price. Acer starts the bidding at 230 Euros (~$320) and uses the same Intel platform as our Toshiba device. 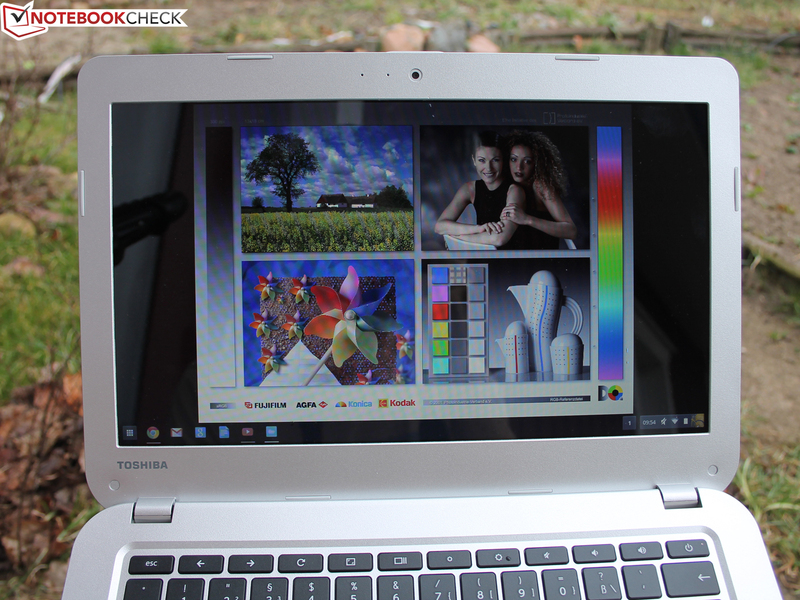 Is the Toshiba CB30 still the better laptop for surfing the Internet? The base and lid are made of silver-coated plastic. We fear that with time, the color may get scuffed off of the corners and places where the notebook is scratched, leaving the notebook looking worn. The construction is only moderately stable; the base in particular can be twisted substantially, producing a cracking sound. The low weight of under 1.5 kilograms (~3.3 pounds) is praiseworthy, especially considering the fact that the notebook's good battery life points to a relatively high battery capacity. High capacity batteries always weigh something. The lid can be twisted slightly. If you push on the backside of the display while carrying or handling the notebook, it takes little force to generate temporary pressure marks on the screen. The Toshiba CB30 does not have a maintenance hatch. The Toshiba device has two USB 3.0 ports, as well as an HDMI port for connecting an external monitor. 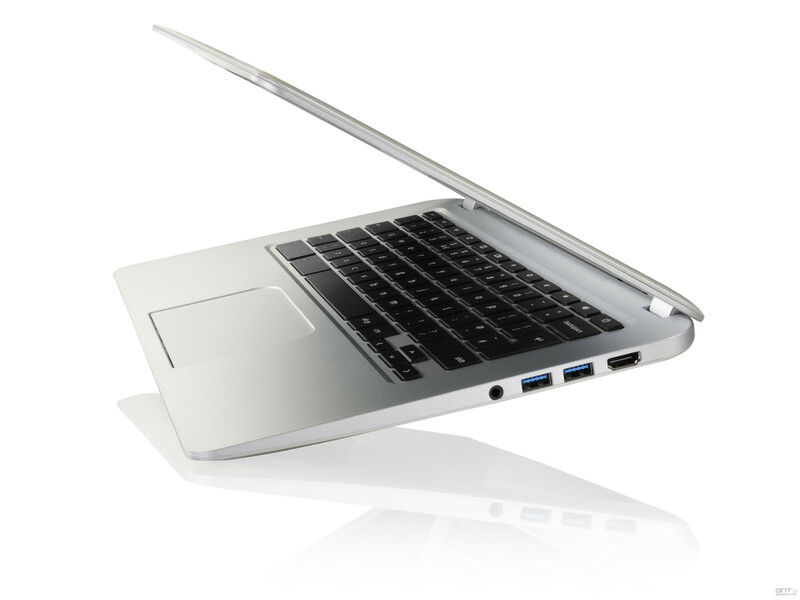 USB 3.0 is available on other current Chromebooks too, for example the Acer C720. But there are also devices with just USB 2.0, for instance the HP Pavilion 14-c010us. Besides the power supply, there are no other accessories included in the Chromebook's packaging. 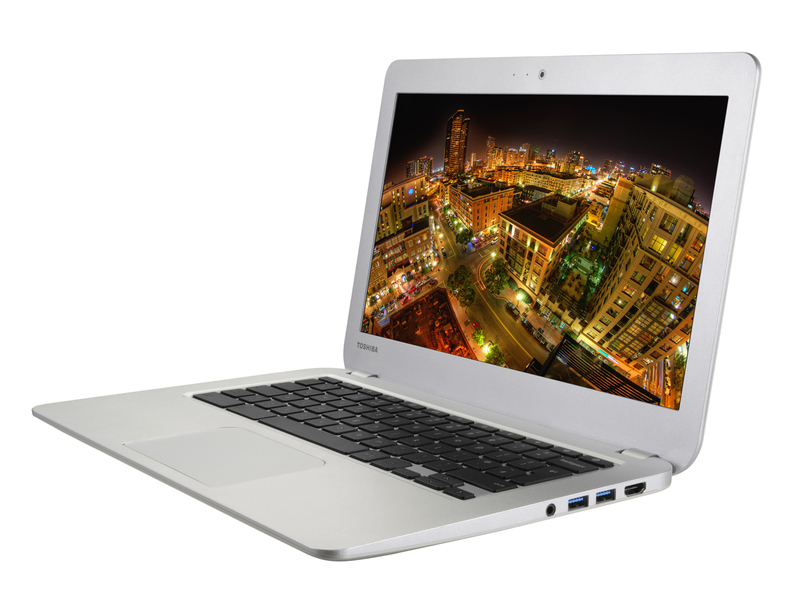 Toshiba outfits their Chromebook with a short 12-month bring-in warranty. 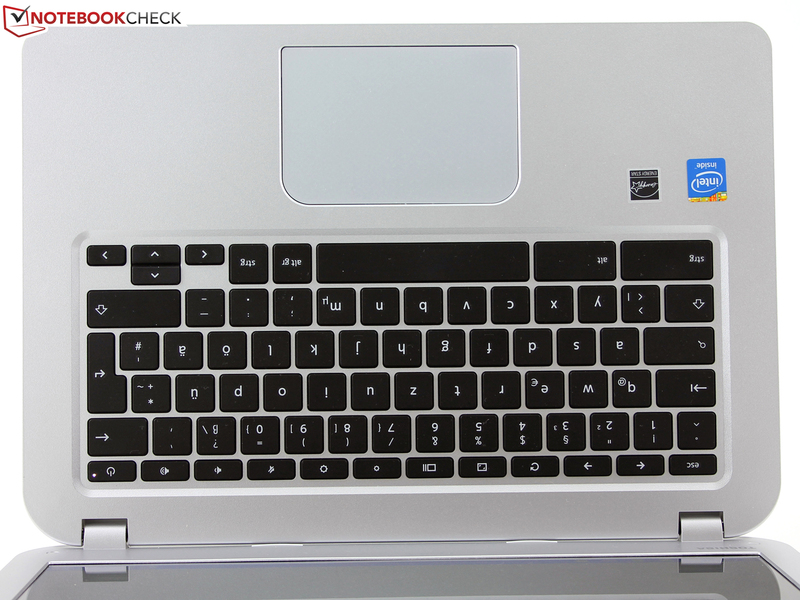 The chiclet keys are spaced widely and have the typical Chromebook layout. At the top of the keyboard, rather than the usual F-keys or combination function keys (Fn+F2 etc. 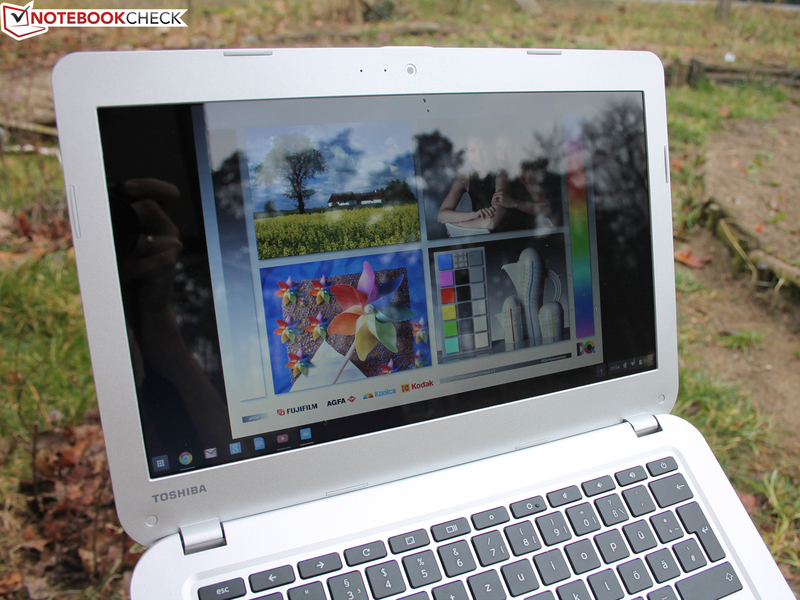 ), Toshiba equipped their notebook with keys that control the browser (Forward/Back/Full Screen/Tab) or the hardware (Brightness/Volume/Mute). The various Chromebook manufacturers certainly make different choices here; the Pavilion 14-c010us has double-assigned F-keys. You can type quickly on the keyboard, but the feedback leaves something to be desired. The slightly spongy feel, short travel length and soft click point all contribute to the problem. 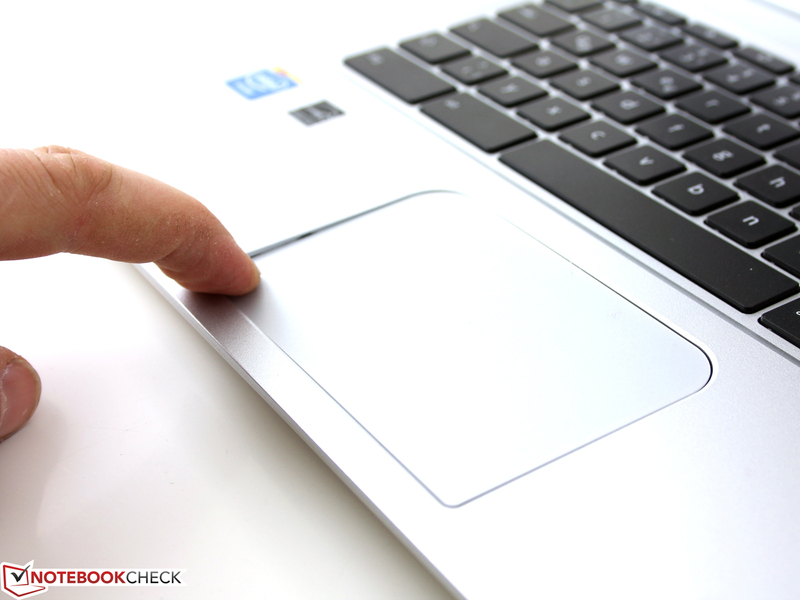 The clickpad does its job somewhat better, mostly due to its clear travel length and distinct click point. The large surface is sensitive to input all the way to its edges. 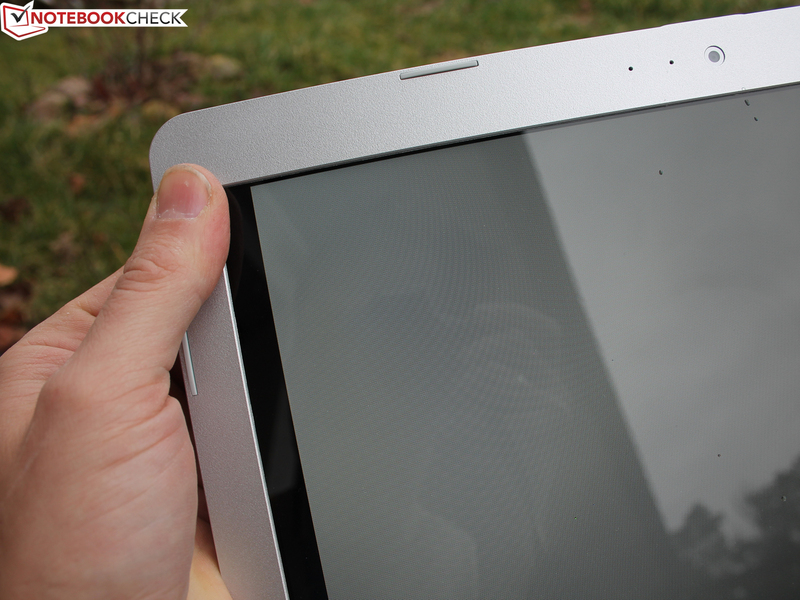 The quality of the glossy TN panel is as mediocre as most displays found in low-cost laptops. 1366x768 pixels on a 13.3-inch screen produce an image that looks coarse even to the naked eye. At the highest brightness setting, the black value is relatively high, which means black areas appear more like dark gray. The contrast is correspondingly low. Most of the competitors do not do much better here. 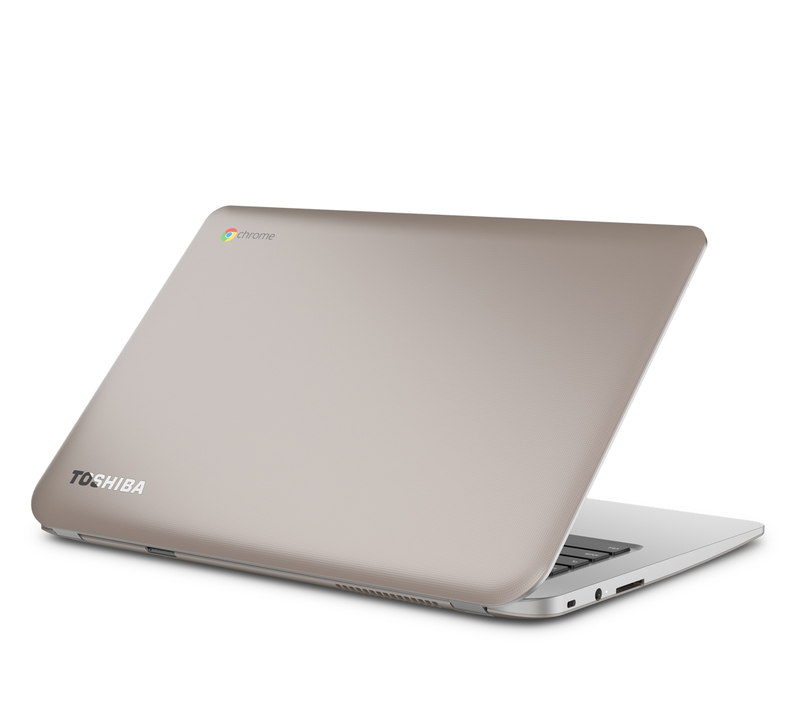 Due to its high price, the Chromebook Pixel cannot really be considered comparable competition. At 256 cd/m², the brightness level is satisfactory, and its full power is still available in battery mode. The Chromebook does not have a brightness sensor and therefore cannot automatically adjust its brightness level to suit the notebook's surroundings. The CB30's colors are definitely a weak spot: Our CalMAN measurements reveal that the display has a conspicuous blue cast. Compared to the sRGB reference, all the colors tend strongly towards the blue/cold. The colors deviate far enough from the ideal values for the naked eye to recognize the problem (see the Saturation graphic). Outdoors: substantial reflections, good brightness. The brightness remains the same in battery mode. Pressure marks appear on the screen while handling the TFT. Chrome OS runs on X86 systems and on ARM platforms (Samsung Chromebook XE303C12-A01US). Like Toshiba, most manufacturers select an Intel chip, in our case the Intel Celeron 2955U from the current Haswell generation (the Acer C720-2800 runs on the same processor). The Celeron 2955U has a clock frequency of 1.4 GHz (dual-core without turbo) and consumes 15 Watts under full load (TDP). We took a closer look at this low-cost processor with integrated HD Graphics in the Acer Aspire E1-532 Windows laptop. As is typical for a Chromebook, the notebook has to make do with just 16 GB eMMC flash. 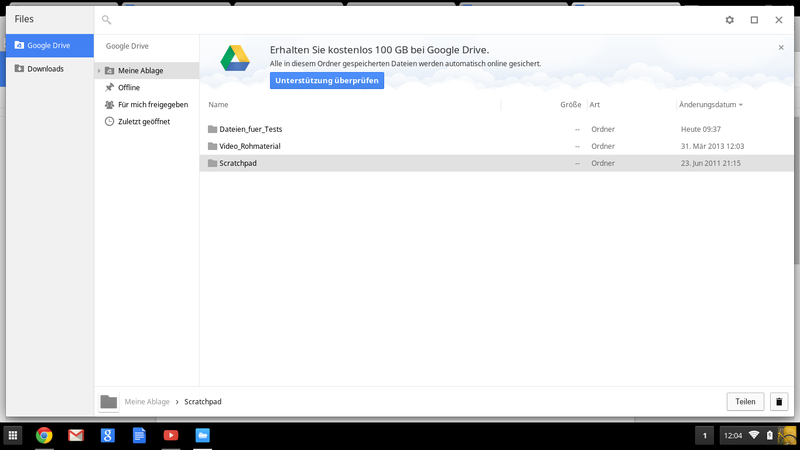 This is possible, however, as the OS conserves more space than Windows, and users save their data in the cloud (Google Drive). As long as the Internet connection is good, the Chromebook reacts very quickly. There are hardly any delays when switching between tabs and numerous windows can be active without the computer needing to take a breather. 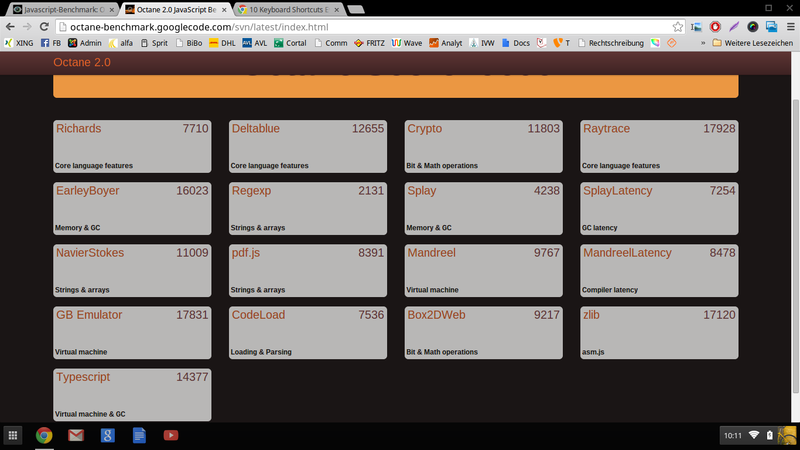 Upon opening the notebook, it only takes a blink of an eye before the last open browser window is already visible. There is no login screen or tile-based user interface to get on your nerves. 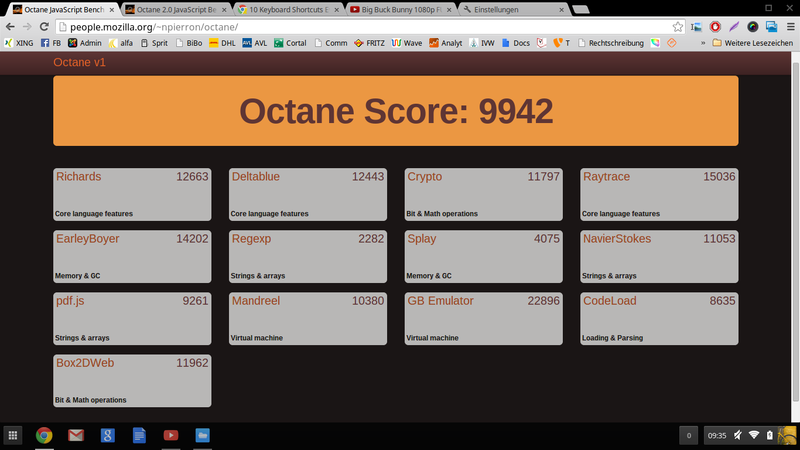 The following screenshots show the sub-scores for the Java benchmarks mentioned above. On the Windows PC we reviewed (Aspire E1-532) the HD Graphics (Haswell) was unable to provide the performance gamers seek. Just a few light titles from 2011 to 2013 ran fluidly at the lowest settings (Dead Space 3, Tomb Raider, GRID 2). Browser games, on the other hand, do not make the HD Graphics break into a sweat. We could not assess whether the GPU uses its turbo to the maximum capacity. But during the 3D rendering portion of the Peacekeeper test, we noticed that the notebook's energy consumption rate rose to an unusually high 18 to 19 Watts. While Octane V2 and H264-Clip (1080p) ran simultaneously, the computer only needed 15 Watts. This is an indication that the HD Graphics does take advantage of its turbo. According to Toshiba's specifications, the HD Graphics runs at 200-1000 MHz. Noise emissions are not really a problem with the CB30. Although there is an active fan, it is barely audible and usually off. Since the Chromebook lacks a hard drive, the notebook is almost silent. Even under stress, the system only generates 30.1 dB(A). Other Chromebooks are louder under load, as the following table shows. 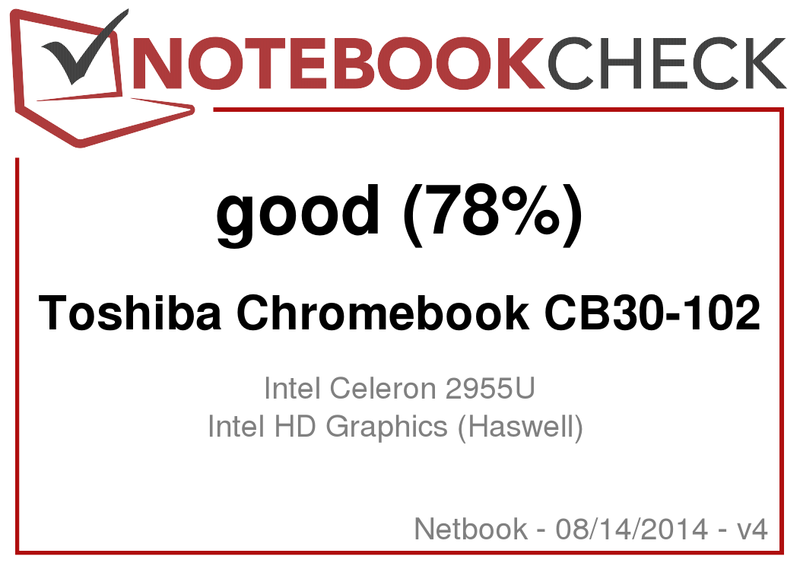 Whether under load or in idle mode, Toshiba's Chromebook remains not only quieter, but cooler too. We measured almost identical surface temperatures in both states. Many of the CB30's competitors do worse here -- that is to say, they grow considerably warmer both in idle mode and under load. (+) The maximum temperature on the upper side is 32.9 °C / 91 F, compared to the average of 33 °C / 91 F, ranging from 21.6 to 53.2 °C for the class Netbook. (+) In idle usage, the average temperature for the upper side is 27.6 °C / 82 F, compared to the device average of 29.8 °C / 86 F.
(+) The average temperature of the palmrest area of similar devices was 29.3 °C / 84.7 F (+3 °C / 5.4 F). The speakers are located on the underside of the base near the front of the notebook. Rather than streaming into the open air, their sound hits the table underneath the device and can be blocked by the user's hands when the laptop is being carried. The two speakers overemphasize mid-tones (no bass). Music can be turned up loud, but the clanging and monotonous sound the speakers generate at high volume is far from a delight to the ears. Headphones or external speakers can be connected via the 3.5 mm jack. The CB30's energy consumption level is below that of similarly equipped competitors, like the HP Pavilion 14-c010us (Celeron, 14-inches). In idle mode (5.6 to 8.8 Watts), the two devices need the same amount of energy, but under load the Toshiba notebook is more frugal. The HP Pavilion 14 consumes up to 25 Watts, whereas the CB30 is usually content with 15 Watts (19 Watts when the GPU is under load). The Acer Aspire E1-532 is outfitted with the same platform and needs 25 to 26.5 Watts, though it is a 15-inch Windows machine with a hard drive (our test device has energy-saving flash memory). We used our WLAN test to assess the notebook's battery life. 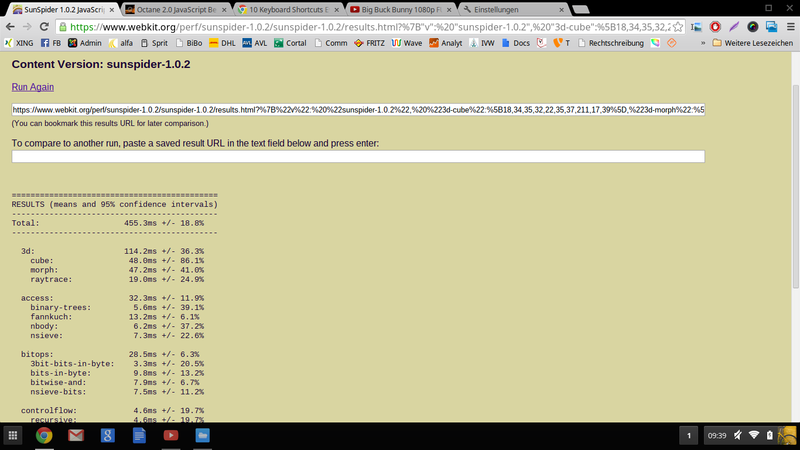 In this test, a script automatically loads a new website every 40 seconds, and the brightness is set to about 150 cd/m² (level 4 with the function key). With a run time of 7:07 hours, the Toshiba does very well here. Only Acer's C720 (45 Wh) and Microsoft's Surface 2 achieve better results. We do not have any information about the built-in battery's capacity. The manufacturer claims the computer has an 8.5-hour battery life. 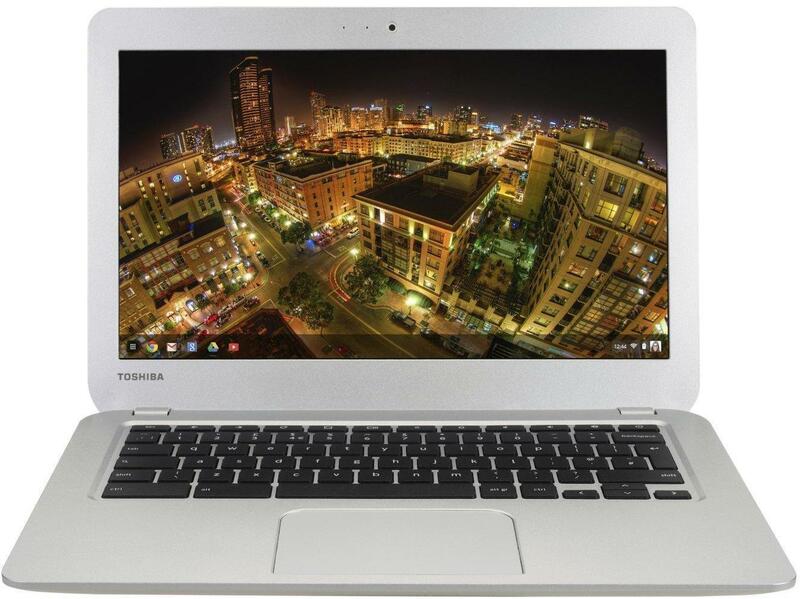 The Toshiba CB30-102 adds to the list of inexpensive Chromebooks. 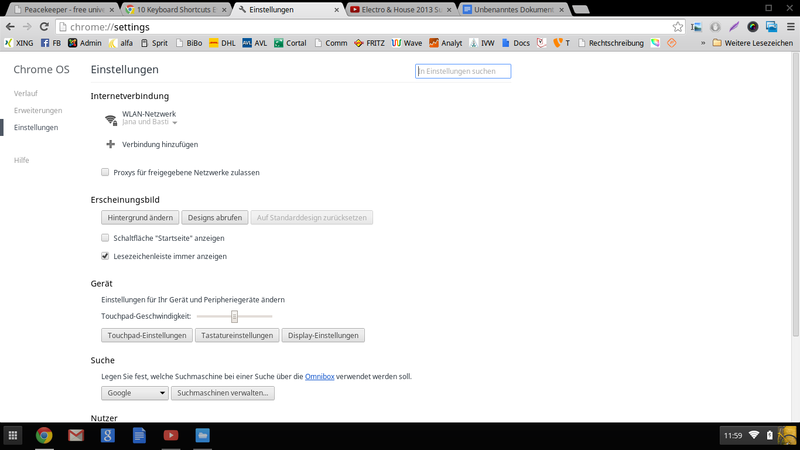 The browser OS seems to have matured. If you are ready to use your Google account instead of local storage, Windows software and complicated hardware settings, you can get a simple, stripped-down notebook and operating system. The CB30-102 fulfills the purpose for which it was created: It is a user-friendly device for accessing web applications, e-mail, photos, films and web-based office tools. All of this is available for 300 Euros (~$420) without the disadvantages of true Windows machines: complexity, storage space, and susceptibility to viruses and malware. For these reasons, we consider the CB30 a viable choice for those who have never used a computer before or are looking for nothing more than a device for surfing the Internet. The CB30's disadvantages are almost purely physical: The keys could have a better feedback, the TFT could be matte (non-touch), and the case could be more stable and higher quality (instead of coated plastic). 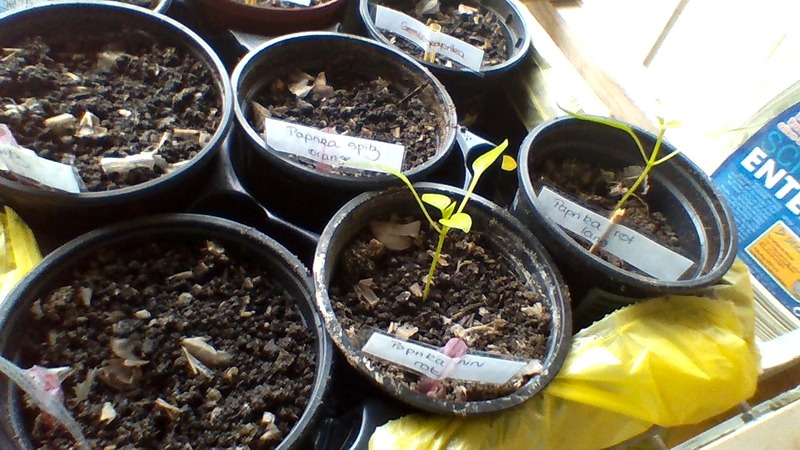 The webcam could also produce better photos. But these points of criticism are par for the course in this price range. Acer's C720 Chromebook is even cheaper, but its keyboard is worse, and its case and display are just as low-quality. 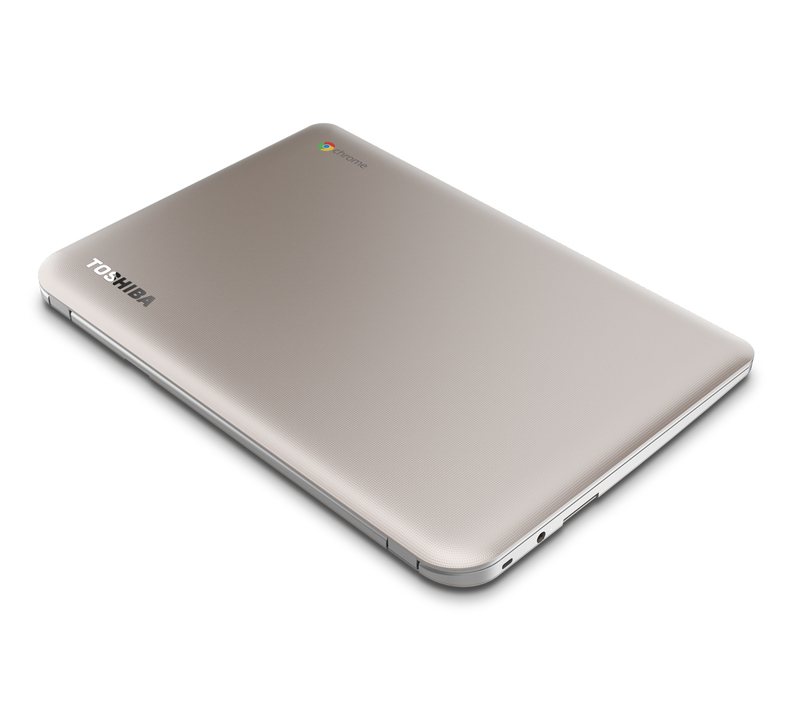 Certainly inexpensive -- Toshiba's Chromebook CB30-102 costs 299 Euros (~$420). In exchange, the notebook's plastic case is not particularly stable. The input devices are alright, but those who write a lot will not enjoy this keyboard. Open it up and start surfing, that is the Chromebook motto. A Google account is the only requirement. 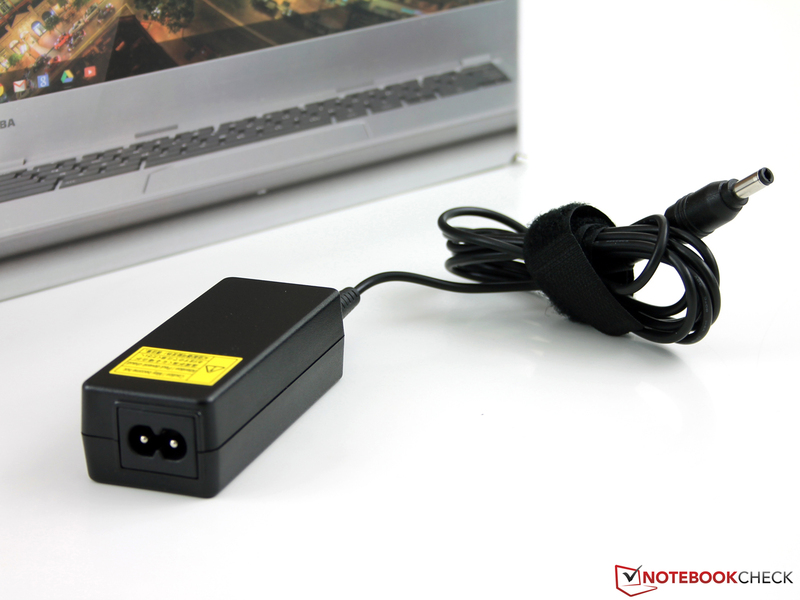 The little power supply provides 45 Watts of energy. ...and transferring files on Google Drive or to an external storage medium (SD card, USB stick) is quicker too. Those who have never used a computer before will not be confused by a plethora of settings and performance modes. There are fewer settings on this notebook than on the average smartphone. Webcam, 1280x720 pixels - lots of image noise, poor focus around the edges. 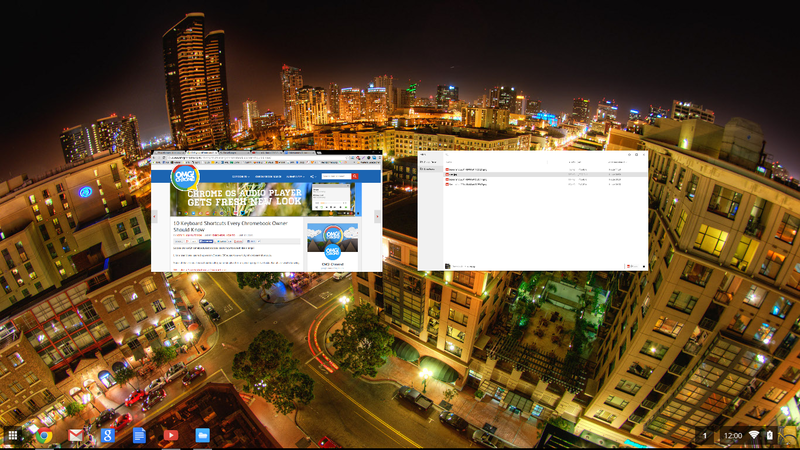 Chrome OS has matured. Surfing, handling files and Google Drive, multimedia -- everything works right from the start. If it is a surfing machine, why not equip it with decent input devices? More feedback would have done the keys a world of good. There are very few hardware settings -- just brightness and the wireless on/off keys. Those who like things simple will be relieved of the burden of today's complex operating systems.